Please contact us to request a more detailed information sheet on a specific hotel and the various room grades if required. 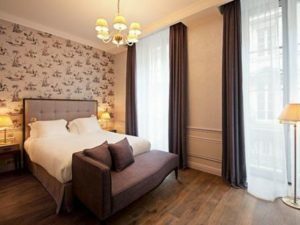 The Oceania l’Univers is a five-floor hotel dating from 1846.The 85 guestrooms are each decorated in contemporary bright colours with fresh wooden flooring and include satellite television, direct-dial telephones, mini-bars and free wireless Internet connection. Bathrooms are equipped with shower/bath combinations, telephones, hair dryers and premium toiletries. Guests can relax on leather sofas in the atrium-style lounge area and browse through the portraits of the hotel’s famous visitors. French gourmet food is served in the restaurant and the lounge bar serves Champagne and a selection of malt whiskies and cocktails. 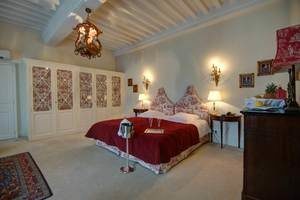 Hotel de la Poste is a grandiose and opulent 4* hotel in central Beaune, ensuring a comfortable and pleasant stay. Offering a wide variety of services including two restaurants and a lounge bar, this hotel is a fantastic base from which to discover the wines of Burgundy. Grape Escapes guests will be accommodated in the hotel’s Charme rooms, which offer views of the city or the garden. Each room is equipped with a double or two single beds, telephone, TV, desk, luggage rack, wardrobe, bedside tables, shower or bath and separate lavatory. Home comforts such as a shower cap, body lotion, shower gel, shampoo, hairdryer and shoe mitt are also provided, as well as an individual safe in each room. This 4* property, boasting its own sauna and fitness room is located in the village of Chablis, on the banks of the River Serein. The gourmet restaurant has views of the pretty garden and offers an extensive wine list that includes 400 local wines and gastronomic dishes such as foie gras and oysters. Free parking, a 24 hour reception and a cosy lounge is available to all guests and a hearty buffet breakfast is served every morning. Each of the 69 individually-decorated rooms have a warm and classic décor with elegant wooden furnishings, a flat-screen TV, free WIFI and en-suite facilities with a hair dryer. This 3* hill-top hotel, situated in the heart of Sancerre offers breathtaking panoramic views of the vineyards, and has modern décor with comfort in mind. The breakfast room boasts views that span miles and each bedroom has its own view overlooking the region. The hotel bar serves a good selection of local wines throughout the day and late into the evening. Guests can also enjoy a swim in the heated outdoor pool, which looks out across the vineyards and those with a new found or long-time love of Sancerre wine can visit the hotel’s wine boutique. Each of the hotel’s 60 rooms have en-suite bathrooms, a TV with Canal and Canal Plus stations, air-conditioning and WIFI internet access. 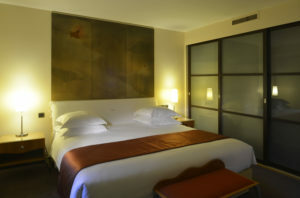 Grape Escapes guests can choose between four different room grades.